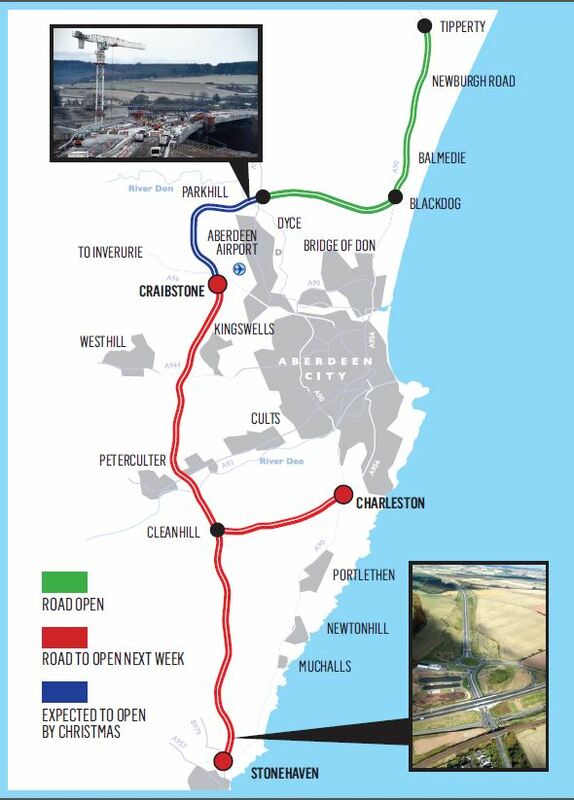 The Aberdeen bypass contractors yesterday said the Stonehaven, Charleston and Craibstone stretch of the dual-carriageway will open next week as they also admitted the entire project has cost more than £1 billion. Fears that the taxpayer could be billed hundreds of millions in extra cash were raised after contractors were grilled by MSPs on Holyrood’s Rural Economy and Connectivity Committee. The opening of the 20 mile stretch is likely to take place on late Wednesday or Thursday and will mean that traffic will be able use more than 85 per cent of the road. The contractors said they still hoped the final section would be ready by Christmas with the completion of the Don Crossing. But with work still being carried out on the bridge, they warned it was still subject to weather and safety checks. Stephen Tarr of Balfour Beatty told MSPs the contractors were “hundreds of millions out of pocket”, saying the cash had been spent in order to avoid further delays on the Aberdeen Western Peripheral Route (AWPR). Although the project has a fixed contract of £745 million, Mr Tarr confirmed that the contractors were seeking compensation from Transport Scotland for the extra money spent on top of that sum. Neither the contractors nor Transport Secretary Michael Matheson would disclose how much was at stake when asked if the cost of the claim was in the region of tens of millions or hundreds of millions. Both argued that such information was bound by commercial confidentiality. But the cost of the entire project came to light when Mr Tarr was asked by North East MSP Lewis Macdonald if he would accept that the sum was now over £1 billion. The figure was greeted with anger by members of the committee. After the meeting the Lib Dem MSP for the North East Mike Rumbles expressed concern that more taxpayers’ cash could end up being spent on the AWPR. “The Scottish Government’s so called ‘fixed price contract’ of £745 million may not turn out to be that,” Mr Rumbles said. “Contractors confirmed that the cost of the road could be up to £1 billion. Mr Tarr gave evidence alongside Bill Hocking of Galliford Try and Brian Love of Aberdeen Roads Limited. Problems to beset the project included the collapse of Carillion, which had been part of the contractors’ joint venture, and severe weather. But Mr Tarr said the compensation claim centred on delays caused by “underperformance” of utility companies when it came to installing more than 300 water pipes, electricity cables, overhead lines and gas pipes across the site. 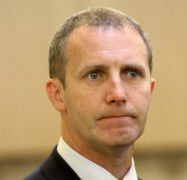 Appearing before the committee, Mr Matheson warned that the contractors’ claims could end up in court. The Transport Secretary said it was “not unusual” for claims to be made during construction projects. He said contractors were required to provide evidence of substantiate their claim and no data had been produced yet. Mr Matheson said: “Any claim over and above that would have to be substantiated and demonstrated for any additional claims to be made. 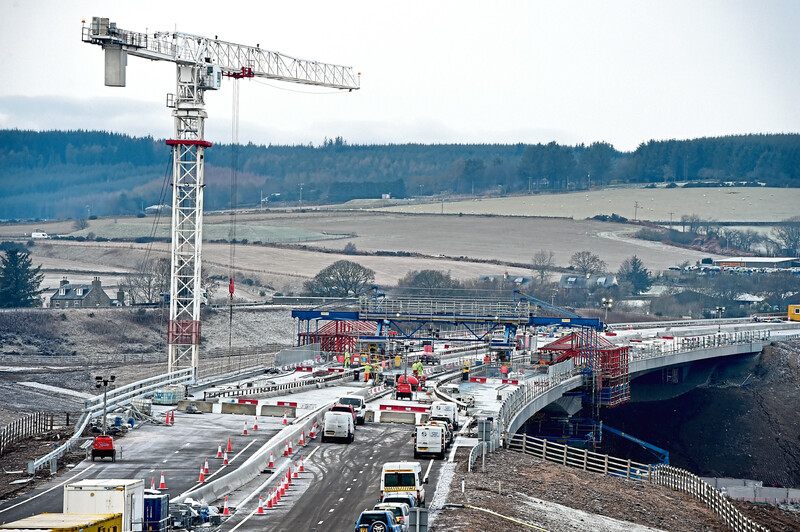 The AWPR contractors explained the Don Crossing problems had been down to problems with the ducts where the steel tensions that hold the 300 metre long structure together are installed. Stephen Tarr of Balfour Beatty said minor cracks had been observed underneath the deck of the structure back in May. The construction operation was stopped and the cracks inspected. The designer assessed the situation and it was found that alignment of some of the ducts had been displaced when the cantilever bridge had been stressed. Unexpected pressure had been exerted on the ducts. The bridge was de-stressed. Workers then bored-out sections of the deck that were affected and the ducts were realigned. Mr Tarr described the work as “painstaking”. In late October, further but similar issues with the ducts were found, which had to be sorted. Mr Tarr added that the issue had been fixed and on Sunday the grouting had been completed as well as the re-stressing of the bridge.